I moved about 3 months ago from the duplex I was renting to the a house I am now renting. The last wine I had in my old place will hopefully be the focus of a short blog later on. I did not have any wine in my new place until about a month ago, such a travesty, but there simply has not any time for wine - I never thought I would utter those words. That brings us to the night of October 18, 2009. After a long 2 months and not as productive weekend, I decided it was time to re-instate the wine on Sundays to start off the week. Early in the fall, I cat-sat for Jill and her husband Kelly. In response, they gave me a bottle of wine a bottle of Domaine Ste. Michelle Frizzante. 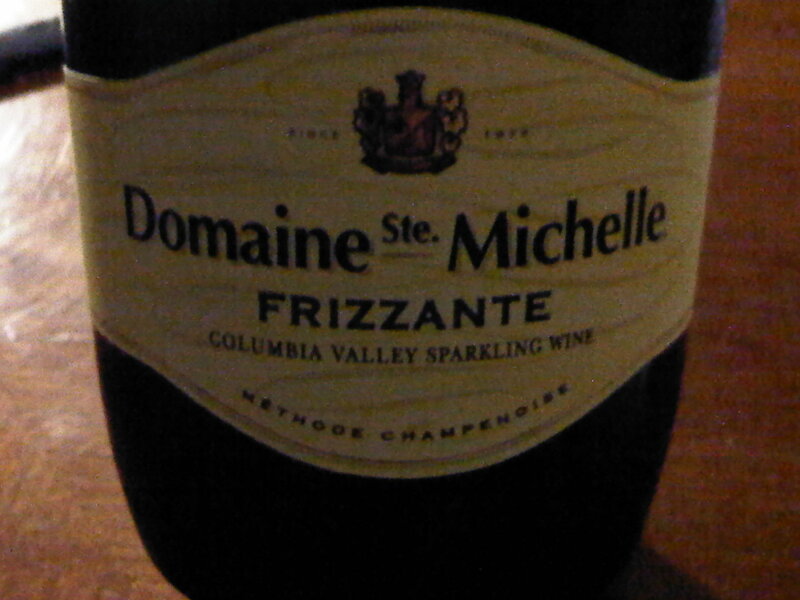 Domaine Ste Michelle makes sparkling wines exclusively. Their website writes about the difference between sparkling wines and champagne - while the processes are the same (methode champenoise), because the wines D Ste M uses are grown in Oregon and Washington, they call them sparking wines. Many of you are familiar with our like, here at the Oregon Wine Blog, of the Semi-Sparkling Muscat Frizzante that Willamette Valley Vineyards produces. When I received this bottle of Frizzante, I assumed it would be similar to the Willamette Valley bottle - fairly sweet very delicious. I was partially right on one of those. The Frizzante from Domaine Ste Michelle is a very good wine, but not really sweet, which is can be a good thing. Unfortunately the D Ste M website does not have any information on their website about the Frizzante, so I am left to my own devices to write about it without much confirmation. Like all sparking wines, thi s should be served chilled, but I did not give it too much time to become room temperature after I removed it from the refrigerator. But nothing could prepare me for the taste. What I like a lot about this sparkling wine is that it isn't too sweet. The "sweetness" of this wine is very subtle - you can only taste it very lightly. There also seems to be the taste of some pears. I really like this sparkling wine, and think that others will like it as well. A word to the wise - not all Frizzantes are created equally, so don't expect them to taste the same. A lesson I learned, and am glad I did. WVV Wine Center Open in McMinnville! The Palm Springs of Washington!